Stop the contamination before it happens ! Mycoplasma is known as a common contaminant in cell cultures, virus stocks, and other cell-derived biologicals. Contaminated cultures must be isolated and destroyed quickly to avoid cross contamination. Especially contaminated lab equipment and lab surfaces cause the spread out of mycoplasma. Only frequent cleansing of all used surfaces and equipment can fight and avoid mycoplasma contamination in laboratories. MycoClean™ Mycoplasma Prevention Spray is an effective solution for reliable disinfection of laboratory surfaces and apparatus including clean benches, incubators, work benches, cell storage boxes and liquid nitrogen containers. 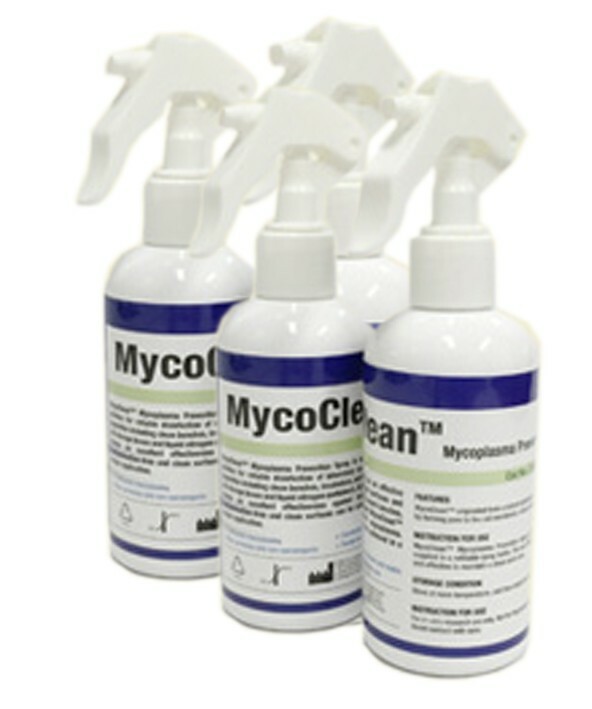 MycoClean™ shows an excellent effectiveness against mycoplasma. Contamination-free and clean surfaces can be achieved in a single application.